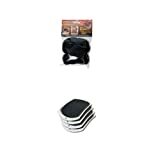 Package includes (4) EZ Move Slides, and (4) Socks for your EZ Move Slides, which will allow you to use them on carpet, and hard surfaces such Vinyl, Wood, Laminate and Tile. 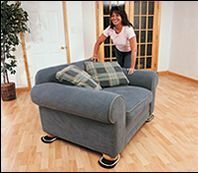 EZ MOVE SKIDS- The 5-3/4" x 9-1/2" EZ Moves were designed to help you move any object, heavy or light, with ease across many surfaces. 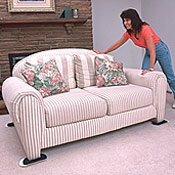 Simply place the EZ Move Slides underneath the object being moved by lightly tilting the object forward or backward, and then push or pull the object to its destination. The EZ Move skids takes normally a 2 person job and turn it into a one person job. The 5-3/4" x 9-1/2" EZ Moves Slides come in a set of 4. 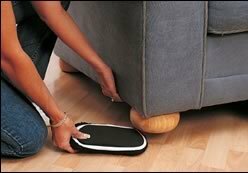 SOCKS - When used properly with EZ Moves for Carpet Furniture Slides, Slip-On-Socks are designed to provide added protection to hard floor surfaces (such as vinyl, tile or hardwood) and to the EZ Moves. 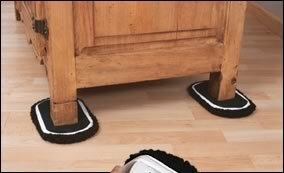 EZ Moves Slip-On-Socks must be used in combination with EZ Moves For Carpet Furniture Slides.